You may now chat on-line with other swingers with our official chat channel: #Couples&Cie on MIRC. We are on the UnderNet server. In order to chat with other couples you need the MIRC software as shown below. If you don't already have it, click on the above image and you will be able to download it. The filename to download is: mirc591t.exe. 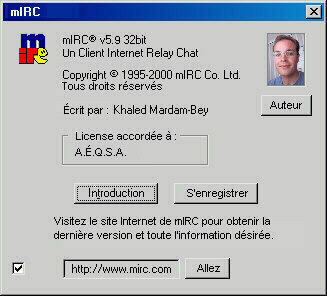 If you don't want to use MIRC to chat, you may still join us using the Java window below. You type in your nickname in the blank and click on «connect». Vidéotron or Sympatico users: You must install a small plug-in called IdentD, and it must be open when you connect. This is a security matter use by Undernet. Quick! Come chat with us!